Munich, Germany’s Panzerballett has been one of my favorite bands for some time now. Merging the intricate brutality of progressive metal with the grace and elegance of modern jazz together with a dash of German humor and a healthy awareness of how bizarre this combination is, they are in my opinion one of the most original and virtuosic bands active at this time. 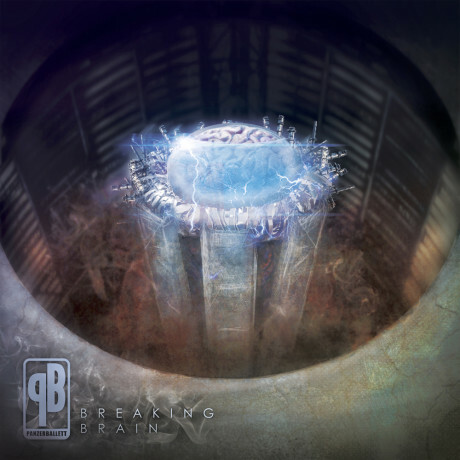 Their fifth full length album, Breaking Brain, sufficiently expands on the formula that they’ve developed over the years and manages to meet my high expectations yet again. Featuring a sax player in what would otherwise be a standard metal band configuration may strike one as a forced gimmick. However, every member of the band is a classically trained jazz musician- Panzerballet should be regarded as a jazz band that’s really into metal, not the other way around. Their technical acumen puts most metal bands to shame, honestly. Who would even think of writing an 11:5 polyrhythm, let alone execute it with such force and precision? The sax works perfectly as an integral part of their sound and the band would be completely different without it. One of Panzerballett’s defining features is that they do a lot of covers, but never straightforwardly. They have their fingers not only in metal and jazz, but a wider variety including funk, world fusion, even some popular music, and seem to take great joy in crossing the streams in all the most unexpected ways. For example, in the past we’ve been treated to a somber acoustic jazz rendition of “Paranoid,” an unrelentingly dissonant avant-djazz version of “Birdland,” and a warped reimagining of “The Simpsons” theme that’s fucked up even for a Danny Elfman composition. The covers this time around are of the classic “Mahna Mahna” by Piero Umiliani, “Shunyai” by Trilok Gurtu, as well as a revamped version of the “Pink Panther” theme that they also did on their second album. Overall I think they did a great job on these as usual. Their style has evolved enough since 2008 that I think the new version of Pink Panther is a legitimate improvement on their first attempt. If you’re already a fan of Panzerballett, you need to get this immediately- you will love it just as much as their other albums. Otherwise, it’s never too late to start! It’s available on Amazon, iTunes, or directly from the band’s website.